One of his favourite restaurants in NY Balthazar. It's a lively French bistro which always crowded. Although we didn't book in advance, since we arrived early evening, we could get a tiny table near entrance after only 5 minutes of waiting. 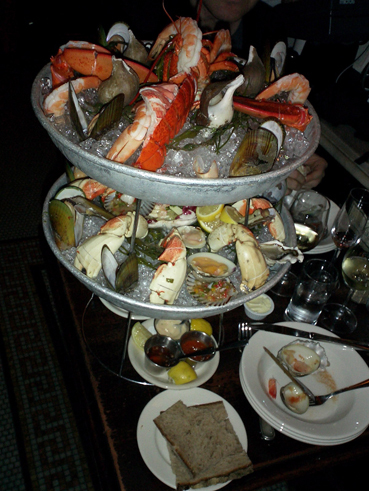 As Balthazar is famouse for its oyster, we decided to try this big seafood plate with champagne. 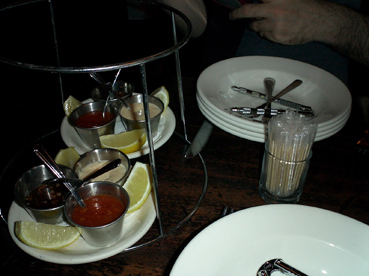 Soon 3 kinds of sauce and piled plates were set on the table. More than enought for 2! 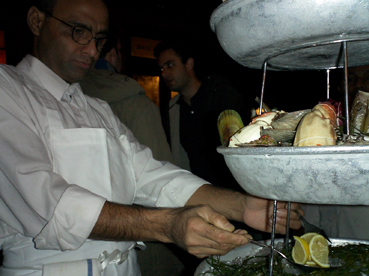 Oysters, scallops, muscles, crab, lobster, prawns and another shellfish which I had never had before. Wish I can get it for my parents one day. They would love it! After a while, your plates get full of shells. Then a waiter appears and bring the top plate away so that you can use the new clean plate below. When the bottom platter getting empty, a waiter comes again and move the food on the bottom platter to the middle platter. Then the tower gets 2 storied from 3. Clever. By the time we got to this point, our body were getting cold from inside and outside (the ice on the plate and cold air from the entrance area). We were both in the mood of something warm. However I still couldn't put even a piece more in my mouth. I was surprised he ordered a (literally) huge steak and actually ate it up! It seems not only me but the restaurant who was impressed by his appetite. With saying "we were very impressed" they kindly gave us icecream chou with hot chocolate on top. It looked great but I just couldn't eat it. For my relief (sort of), he couldn't eat it all either. Seafood we couldn't eat that night was doggiebaged for us. If I ever have a chance to bring my parents to NY, I'll definitely take them here. 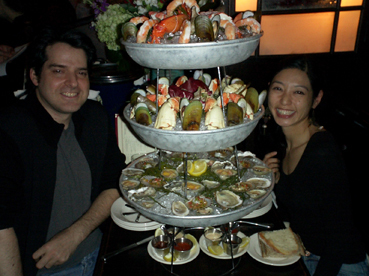 By the way, this seafood platter was probably easily for 4 - 5 people and costs only 99 dollars.